Without question, one thing our four-legged companions love to do, is chew! Can be anything from one of your favorite pair of shoes to the side of your leather couch. 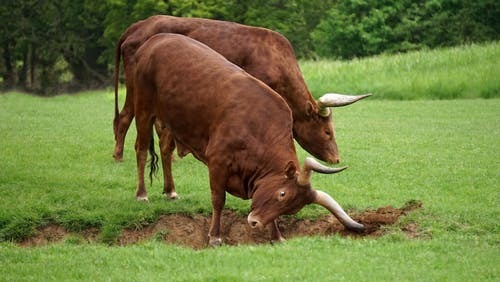 Turn your back for just one second, and it is not uncommon to see them gnawing on something. If only you could find a healthy alternative to this unwanted behavior! For many dog owners, they have turned to a product that eliminates this behavior and one that actually provides a healthy source of activity. Bully sticks for dogs have become quite popular and have actually replaced the number of questionable treats on the market today. Bully Sticks For Dogs: What Exactly, Are They? Okay, we are all familiar with the more common type of dog treats including bones, biscuits, dental, soft and hard treats, etc. So what are these bully sticks and what makes them different from these common treats? Let’s take a closer look at bully stick in more detail. 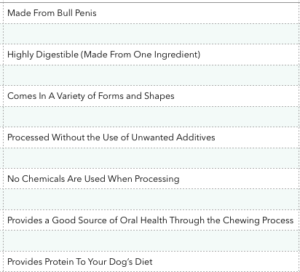 Bully Sticks for dogs are made from bull penises, yep, you read that correctly. Those companies in the business of producing this product will actually dry this product and add flavor before they are available to dog owners. This process allows the product (also called Pizzles) to retain its original state and flavor. Unlike your favorite pair of shoes, the Bully Stick actually contains some nutritional value that may provide benefits to your pet. You can find these products as all-natural, which is an added bonus when you consider other treats on the market that provide little to no nutritional value to your pet. Are They Safe For Your Dog? This is probably the most important question you should ask as it pertains to the bully stick. 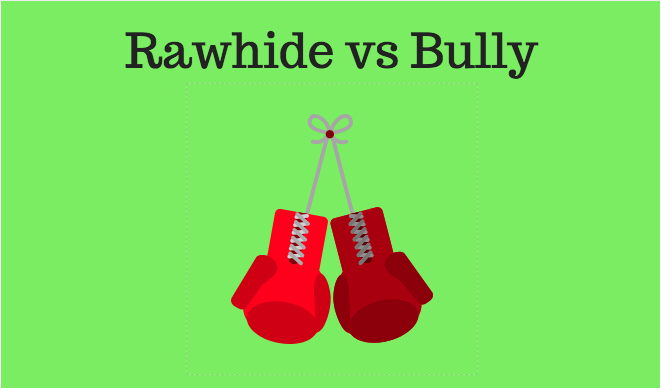 In a nutshell, the type or brand that you choose will go a long way in determining how safe it is. Make sure you look at the ‘all-natural’ brands and ones that do not contain any artificial coloring, dyes or harmful chemicals. With that said, you should always pay close attention when your pet is enjoying the bully stick. The key is to make sure your pet doesn’t bite off or chew too large of a chunk of the stick. Large pieces or chunks can sometimes make it difficult for dogs to swallow, increasing the risk of choking. That explains why monitoring your pet is so important. There are a number of calories (6 inch stick has over 80 calories) contained within a bully stick that may eventually put on some unwanted pounds on your pet. Like everything else, pet owners would be smart to give their dogs these bully sticks in moderation. In addition, Canine Journal indicated that a small study conducted with bully sticks, showed that some actually contained some bacteria that may cause harm to your pet. Purchasing all-natural bully sticks and ones made from the USA should eliminate these concerns. What Is The Best Bully Stick For My Dog? You should easily be able to find a type of bully stick that will be appropriate for your dog. Hopefully, one of the types mentioned above will do the trick and provide your pet with a stick they will enjoy. Dogs love the taste! Delicious! Oral Health – The chewing process is great for the dog’s gums, tartar and plaque build up, and to maintain strong teeth. Being all-natural, your pet will find these treats to be easy to digest. High in protein which is essential to the overall health of your dog. Can be purchased in various forms and sizes. Free from artificial flavors, wheat, grains and soy. Long-lasting, keeping your four-legged companion bust. Calories – Bully sticks, as mentioned earlier, do contain a great deal of calories. Not a great source for the overweight dog. Supervision is highly suggested, making sure your pet is not in danger of choking. As you can see, the benefits certainly outweigh the disadvantages when it comes to this specific treat. 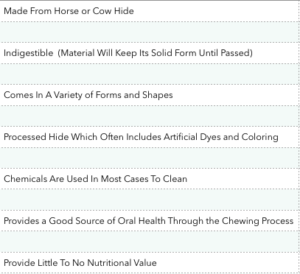 Let me ask you a question: If you knew absolutely nothing about the products mentioned above, and were looking to find a healthy treat for your pet, which one would you choose from the details mentioned above? Obviously, the healthier choice is the one to the right or the bully stick. Chemicals, artificial coloring, zero nutritional value are things I simply don’t want to put in front of my dog. The choice is yours! In conclusion, I certainly hope this article has been beneficial to you. 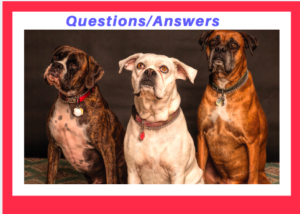 My hope was to provide you specific information as it pertains to the bully sticks for dogs and help you to make an educated decision when it comes to choosing a healthy treat for your pet. 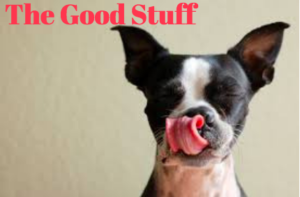 If you have interest in the bully stick, you can find a number of quality products and brands by clicking on the link below. 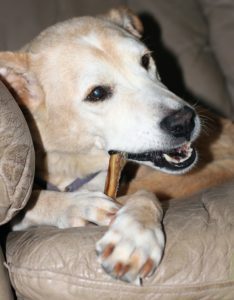 Shop Customer Favorite Bully Sticks at Chewy! What are your thoughts on the bully stick? Feel free to leave a comment below and thanks for visiting my site.